Fruit aggregate resembling a mace has ornamental value. Sedges help control erosion and the seed feeds wildlife. 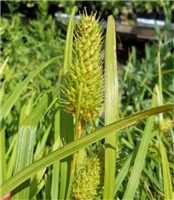 A graceful sedge bearing long, pendulous spikes. Aids in erosion control and will spread by rhizomes to form colonies. Seed provides food for songbirds and waterfowl. Rain Gardens, ponds, waterways. This grass has ornamental value, winter interest, and dangling seed can be used in arrangements. It may spread under favorable conditions so consider placing it in a contained situation. Excellent choice for stream-sides, slopes and erosion control. Provides cover and seed for birds. Grown from Kentucky-source seed. Like many sedges, Shallow Sedge bears interesting fruiting spikes. Sedges provide cover and seed for waterfowl and are food for many insects which in turn are eaten by birds. Used as an ornamental grass with silvery & bluish green leaves in rain gardens & pollinator gardens. Attractive bronze fall foliage & purplish flowers. Provides food & cover for wildlife. Highly ornamental grass with thread-like leaves that form a tidy clump to 2 feet in height. Named for the lasting pink clouds of flowers that rise to 1 foot above the leaves. Like other sedges, this plant is excellent for wildlife and for erosion control on the banks of lakes, streams and other waterways. A low growing, clump-forming ornamental grass that tolerates dry, sandy soils in full sun. Airy reddish-purple inflorescence's appear in August and last through September and are a pleasant addition to floral arrangements. Grown from Kentucky-source seed.